Will Rohit Sharma be included in the playing XI? 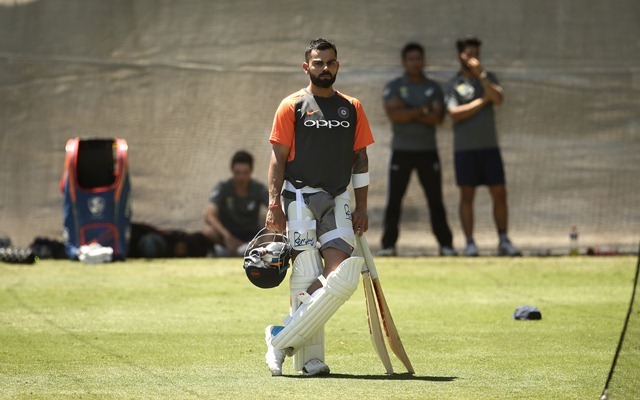 The highly anticipated Test series between Australia and India will get underway on Thursday in Adelaide. The tourists, for the first time this year, played a proper practice game after what transpired in South Africa and England. Their batsmen have also prepared in a better way by travelling to New Zealand in order to replicate similar conditions playing for India A. Very rarely a visiting team is touted as the favourites to win a Test series in Australia and the number 1 ranked Team India have the capability to create history this time. Once again, all the eyes will be on their team selection in the series opener which has been questionable in the past with the captain Virat Kohli taking inexplicable decisions. They have been jolted with an injury blow to Prithvi Shaw but the other two openers look confident enough to make up for the youngster’s absence. Murali Vijay made a comeback to the Test purely based on his experience of playing in Australia. He was the back-up opener for them but an injury to Shaw opened the doors of the side for him. Vijay also smashed a ton in the second innings of the practice game which proved that he is up for the challenge down under. It’s time for him to deliver after disappointing in the last two overseas tours. KL Rahul’s lean run in Tests has extended a lot now and apart from a century in the fifth Test against England, he has nothing to show. But the most talented batsman in the line-up got some confidence back with a half-century in the warm-up game and would be looking to build on it. He will have to face the music with the new ball and it will all depend on how he starts this series. Cheteshwar Pujara, India’s best number three, has to start the series well now. In England, he got a fair amount of runs but wasn’t consistent. He and Ajinkya Rahane will have to support the skipper Virat Kohli to form a rock-solid middle-order. If this trio clicks together in the first Test itself, then it will be really for the home side to make a comeback. Moreover, runs from Pujara and Rahane will assure Kohli of not to worry much and then he can play his own game not thinking much about others. Hanuma Vihari has also been in the plans for some time now and the fact that he batted in both the innings of the practice game makes him a surety in the playing XI. There was a feeling of Rohit Sharma replacing him but as of now, India’s limited-overs vice-captain will have to wait it seems. Vihari has also looked confident in the lead up to the series scoring runs in New Zealand and in the practice game. Rishabh Pant is another young prodigy who will be under the scanner. While there is no doubt about his batting, many felt that Pant is a little under-cooked in wicketkeeping. It will be interesting to see how he fares on the big Australian grounds. Now, this could be a tricky call for Kohli to take. Ravindra Jadeja performed extremely well in the fifth Test in England while Ravi Ashwin was injured. But if the practice game is anything to go by, the off-spinner is all set to return to the line-up. Ashwin reinvented himself on the last Australia tour and this time he will be keen on improving even more. However, his fitness has always been a concern and should be good to go in the first Test at least. India never had so many options in the fast bowling department before. On merit and recent form, Mohammed Shami, Ishant Sharma and Jasprit Bumrah will play this game hands down. Bhuvneshwar Kumar has been extremely good but the visitors will have to take a tough decision to leave him out. The trio of Shami, Ishant and Bumrah has always kept the opposition batsmen on the tenterhooks and they will eye to do the same even in this game. However, they have been guilty of relaxing a wee-bit after dismissing the top-order of the opposition which was the case in England. Sam Curran took the game away from India in a jiffy and they should be wary of it this time. Even Australia have decent lower-order batters and the Indian pacers will have their task cut out once again.